Jonathan Linke of the Woonsocket FFA Chapter has been selected as a finalist for the South Dakota State Star Greenhand Award. Jonathan’s application first was selected by District 4, as one of the district level finalists. As a district level finalist, he then went on to the state level to compete against 12 other Greenhand FFA finalist from across South Dakota. After being judged by a committee, his application was one of four to be selected as a state level finalist. 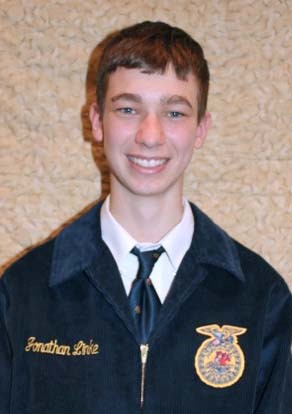 Jonathan will now go on to interview for the SD FFA State Convention in Brookings, April 14-16. All four state level finalists will be recognized and the winner will be announced at the Star Pageant, during the evening session on Monday, April 15. The state winner will receive a plaque and a $100 check from the SD FFA Foundation. Also, each finalist will receive a plaque and a $25 check from the SD FFA Foundation. The award is sponsored by Central Farmers Cooperative as a special project of the SD FFA Foundation. The Woonsocket Community Club has donated $100 toward the Prairie View Care Center’s annual Easter Egg Hunt, which will be the morning of March 30. 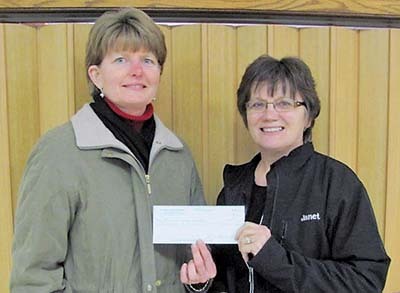 Shown is Emily George, secretary/treasurer of the Community Club, giving the donation to Janet Baysinger, activity director of the nursing home. 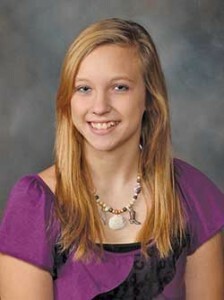 Hannah Spelbring was recently named the Artesian Girls State representative with Jessica Schmit being an alternate. Artesian Girls State representatives are sponsored by the Artesian American Legion Auxiliary.